The Israeli air force carried out strikes Monday in southern Lebanon despite an agreement to halt raids for 48 hours after nearly 60 Lebanese civilians were killed in an Israeli bombing, the army said. An Israeli military spokesman told CBS News the air force has provided cover to ground forces near Taibe in southern Lebanon. The Israelis feel that doesn't violate their pledge to stop the bombing for two days. Meanwhile, Hezbollah guerrillas attacked an Israeli tank in southern Lebanon, wounding three soldiers, the military said. The attack occurred near the villages of Kila and Taibe on border, where Israeli ground forces have been fighting Hezbollah guerrillas for nearly two weeks. Israel Radio also reported that Hezbollah rockets hit the northern town of Kiryat Shemona. No casualties were reported in the rocket attacks, the radio said. Hours before the fighting started up again, Secretary of State Condoleezza Rice urged the U.N. Security Council to arrange for a cease-fire agreement by week's end that would include the formation of an international force to help Lebanese forces control southern Lebanon. The Council was expected to meet Monday to sound out members about contributing troops to a peacekeeping force, reports CBS News foreign affairs analyst Pamela Falk. President Bush again insisted Monday that any Mideast cease-fire be accompanied by a wider agreement. "We want there to be a long-lasting peace, one that is sustainable," he said after a meeting with Cuban-American business leaders in a Miami restaurant. Later, in a speech at the Port of Miami, he added, "It is important to remember this crisis began with Hezbollah's unprovoked terrorist attacks against Israel. Israel is exercising its right to defend itself." Haifa has returned to life after Israel's suspension of air strikes in Lebanon, reports CBS News correspondent Robert Berger (audio). However, police were on high alert, sealing off streets and setting up roadblocks for fear of a suicide bombing attempt. Israeli Defense Minister Amir Peretz told parliament that the war against Hezbollah is not over, reports Berger. He said the offensive will continue until Hezbollah has no more ability to attack Israel from south Lebanon. Cabinet ministers were to meet to consider stepping up the ground offensive. Thousands of civilians trapped in south Lebanon's war zone for three weeks made an exodus for the north Monday, taking advantage of Israel's 48-hour pause in air strikes to flee. The cessation of air strikes was called after nearly 60 civilians were killed in an Israeli bombing of the Lebanese village of Qana on Sunday. That only added fuel to the ongoing Lebanese-Israeli animosity, reports CBS News correspondent Vicki Barker (audio) in the Chouf Mountains of Lebanon. Israelis are troubled about the civilian casualties in Qana, reports Berger, but it has not eroded their support for the war in Lebanon. They say Hezbollah has fired some 2,000 rockets at Israel and the group must be crippled. They also say that Hezbollah deliberately targets civilians, while Israel does not. 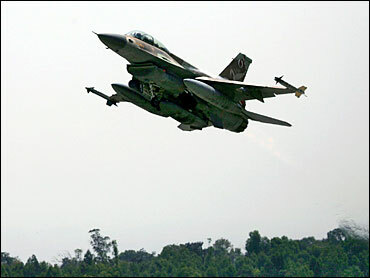 Israel had announced the suspension of air strikes for 48 hours starting at 2 a.m. Monday. But Hezbollah legislator Hassan Fadlallah had questioned Israel's motivation, telling Lebanese television it was just "an attempt to absorb international indignation over the Qana massacre." The bombing of Qana on Sunday led to demands around the world for an immediate cease-fire. Israeli Prime Minister Ehud Olmert told Rice over the weekend that Israel would need 10 to 14 more days to finish its offensive, and Justice Minister Haim Ramon told Army Radio on Monday that he did not think the fighting was over yet. "I'm convinced that we won't finish this war until it's clear that Hezbollah has no more abilities to attack Israel from south Lebanon. This is what we are striving for," Ramon said. The stunning bloodshed in Qana increased international pressure on Washington to back an immediate end to the fighting and prompted Rice to cut short her Mideast mission to return home Monday. "I am convinced that only by achieving both will the Lebanese people be able to control their country and their future, and the people of Israel finally be able to live free of attack from terrorist groups in Lebanon," Rice said in a nationally televised speech before leaving Israel. The U.S. has been working for two-and-a-half weeks to stop the fighting, Undersecretary of State Nicholas Burns said on CBS News' The Early Show Monday. "We hope there will be a cease-fire, if we can work that out. And most importantly, there has to be an international force that goes into south Lebanon to separate them and make sure that Hezbollah can no longer attack the state of Israel," Burns told co-anchor Hannah Storm. An Israeli army spokesman left open the possibility that Israel might still hit targets to stop imminent attacks on the country, despite the air strike suspension. He also made clear the Israelis could end the suspension depending on "operational developments" in Lebanon. The army said that the temporary cessation of aerial activity would allow the opening of corridors for Lebanese civilians who want to leave south Lebanon for the north and would maintain land, sea and air corridors for humanitarian assistance. By early afternoon Monday, roads from villages into the port city of Tyre and heading north along the coast were packed with thousands of refugees in pick-up trucks and cars. With many of the main roads too shattered for use, cars took to dirt side roads, still waving white flags out their windows or covering the vehicles roofs with white sheets. After news of the deaths emerged, Rice telephoned Lebanese Prime Minister Fuad Saniora and said she would stay in Jerusalem to continue work on a peace package, rather than make a planned Sunday visit to Beirut. Saniora said he told her not to come. "They spoke today," Burns said. "And we are putting together the agreement between the government of Lebanon and Israel. So there's no lack of contact with the Lebanese government. Hezbollah vowed retaliation for Qana on its Al-Manar television, saying: "The massacre at Qana will not go unanswered." It hit northern Israel on Sunday with 157 rockets — the highest one-day total during the offensive — with one Israeli moderately wounded and 12 others lightly hurt, medics said. Israel apologized for the deaths and promised an investigation, but said Hezbollah had fired more than 40 rockets from Qana before the air strike, including several from near the building that was bombed. Foreign Ministry official Gideon Meir accused Hezbollah of "using their own civilian population as human shields."